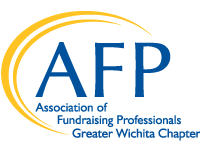 The mission of the Greater Wichita Chapter of AFP is to “foster effective and ethical professionals to inspire the spirit of philanthropy.” With 93 members, the chapter is part of a network of 270 chapters worldwide within the international Association of Fundraising Professionals organization. The chapter leadership offers educational and professional development programs for fundraisers. The chapter sponsors the annual National Philanthropy Day in Wichita, which honors individuals and organizations whose volunteer leadership and giving have enhanced the quality of life in Wichita and Sedgwick County. The AFP Greater Wichita Chapter has earned the Ten Star Chapter designation since 2011. This designation, bestowed by AFP International, acknowledges the exemplary work of high performing chapters across the world.